Not to be confused with the island of Elba. The Elbe (/ˈɛlbə/; Czech: Labe (help·info) [ˈlabɛ]; German: Elbe [ˈɛlbə]; Low German: Elv, historically in English also Elve) is one of the major rivers of Central Europe. It rises in the Krkonoše Mountains of the northern Czech Republic before traversing much of Bohemia (Czech Republic), then Germany and flowing into the North Sea at Cuxhaven, 110 km (68 mi) northwest of Hamburg. Its total length is 1,094 kilometres (680 mi). The Elbe's major tributaries include the rivers Vltava, Saale, Havel, Mulde, Schwarze Elster, and Ohře. 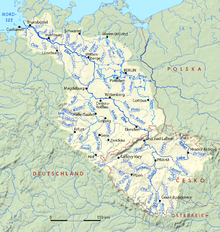 The Elbe river basin, comprising the Elbe and its tributaries, has a catchment area of 148,268 square kilometres (57,247 sq mi), the fourth largest in Europe. The basin spans four countries, with its largest parts in Germany (65.5%) and the Czech Republic (33.7%). Much smaller parts lie in Austria (0.6%) and Poland (0.2%). The basin is inhabited by 24.4 million people. 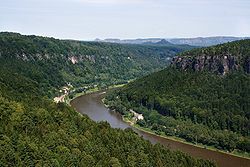 The Elbe rises at an elevation of about 1,400 metres (4,593 ft) in the Krkonoše (also known as Giant Mountains or in German as Riesengebirge) on the northwest borders of the Czech Republic near Labská bouda. Of the numerous small streams whose waters compose the infant river, the most important is the Bílé Labe, or White Elbe. After plunging down the 60 metres (197 ft) of the Labský vodopád, or Elbe Falls, the latter stream unites with the steeply torrential Malé Labe, and thereafter the united stream of the Elbe pursues a southerly course, emerging from the mountain glens at Jaroměř, where it receives Úpa and Metuje. Here the Elbe enters the vast vale named Polabí (meaning "land along the Elbe"), and continues on southwards through Hradec Králové (where Orlice flows in) and then to Pardubice, where it turns sharply to the west. At Kolín some 43 kilometres (27 mi) further on, it bends gradually towards the north-west. At the village of Káraný, a little above Brandýs nad Labem, it picks up the Jizera. At Mělník its stream is more than doubled in volume by the Vltava, or Moldau, a major river which winds northwards through Bohemia. Upstream from the confluence the Vltava is in fact much longer (434 kilometres (270 mi) against 294 kilometres (183 mi) of the Elbe so far), and has a greater discharge and a larger drainage basin. Nonetheless, for historical reasons the river retains the name Elbe, also because at the confluence point it is the Elbe that flows through the main, wider valley while the Vltava flows into the valley to meet the Elbe at almost a right angle, and thus appears to be the tributary river. Some distance lower down, at Litoměřice, the waters of the Elbe are tinted by the reddish Ohře (Eger). Thus augmented, and swollen into a stream 140 metres (459 ft) wide, the Elbe carves a path through the basaltic mass of the České Středohoří, churning its way through a picturesque, deep, narrow and curved rocky gorge. Shortly after crossing the Czech-German frontier, and passing through the sandstone defiles of the Elbe Sandstone Mountains, the stream assumes a north-westerly direction, which on the whole it preserves right to the North Sea. The river rolls through Dresden and finally, beyond Meißen, enters on its long journey across the North German Plain passing along the former western border of East Germany, touching Torgau, Wittenberg, Dessau, Magdeburg, Wittenberge, and Hamburg on the way, and taking on the waters of the Mulde and Saale from the west, and those of the Schwarze Elster, Havel and Elde from the east. In its northern section both banks of the Elbe are characterised by flat, very fertile marshlands (Elbe Marshes), former flood plains of the Elbe now diked. At Magdeburg there is a viaduct, the Magdeburg Water Bridge, that carries a canal and its shipping traffic over the Elbe and its banks, allowing shipping traffic to pass under it unhindered. The Middle Elbe in the North German Plain near the village of Gorleben. In this section, the river had been part of the Iron Curtain between West and East Germany during the Cold War. For that reason, the river banks even today look relatively natural and undeveloped. From the sluice of Geesthacht (at kilometre 586) on downstream the Elbe is subject to the tides, the tidal Elbe section is called the Low Elbe (Unterelbe). Soon the Elbe reaches Hamburg. Within the city-state the Unterelbe has a number of branch streams, such as Dove Elbe, Gose Elbe, Köhlbrand, Northern Elbe (Norderelbe), Reiherstieg, Southern Elbe (Süderelbe). Some of which have been disconnected for vessels from the main stream by dikes. 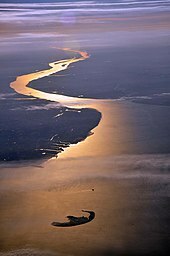 In 1390 the Gose Elbe (literally in English: shallow Elbe) was separated from the main stream by a dike connecting the two then-islands of Kirchwerder and Neuengamme. The Dove Elbe (literally in English: deaf Elbe) was diked off in 1437/38 at Gammer Ort. These hydraulic engineering works were carried out to protect marshlands from inundation, and to improve the water supply of the Port of Hamburg. After the heavy inundation by the North Sea flood of 1962 the western section of the Southern Elbe was separated, becoming the Old Southern Elbe, while the waters of the eastern Southern Elbe now merge into the Köhlbrand, which is bridged by the Köhlbrandbrücke, the last bridge over the Elbe before the North Sea. The Northern Elbe passes the Elbe Philharmonic Hall and is then crossed under by the old Elbe Tunnel (Alter Elbtunnel), both in Hamburg's city centre. A bit more downstream the Low Elbe's two main anabranches Northern Elbe and the Köhlbrand reunite south of Altona-Altstadt, a locality of Hamburg. Right after both anabranches reunited the Low Elbe is passed under by the New Elbe Tunnel (Neuer Elbtunnel), the last structural road link crossing the river before the North Sea. At the bay Mühlenberger Loch in Hamburg at kilometre 634, the Northern Elbe and the Southern Elbe (here now the cut-off meander Old Southern Elbe) used to reunite, which is why the bay is seen as the starting point of the Lower Elbe (Niederelbe). Leaving the city-state the Lower Elbe then passes between Holstein and the Elbe-Weser Triangle with Stade until it flows into the North Sea at Cuxhaven. Near its mouth it passes the entrance to the Kiel Canal at Brunsbüttel before it debouches into the North Sea. 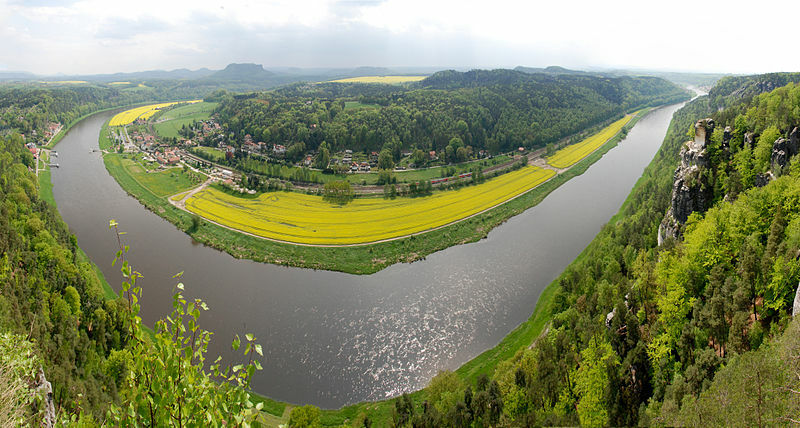 View of the Elbe in Saxon Switzerland, an area in Germany. The Elbe has been navigable by commercial vessels since 1842, and provides important trade links as far inland as Prague. The river is linked by canals (Elbe Lateral Canal, Elbe-Havel Canal, Mittellandkanal) to the industrial areas of Germany and to Berlin. The Elbe-Lübeck Canal links the Elbe to the Baltic Sea, as does the Kiel Canal, whose western entrance is near the mouth of the Elbe. The Elbe-Weser Shipping Channel connects the Elbe with the Weser. By the Treaty of Versailles the navigation on the Elbe became subject to the International Commission of the Elbe, seated in Dresden. The statute of the Commission was signed in Dresden on February 22, 1922. Following articles 363 and 364 of the Treaty of Versailles, Czechoslovakia was entitled to lease its own harbour bassin, Moldauhafen in Hamburg. The contract of lease with Germany, and supervised by the United Kingdom, was signed on February 14, 1929 ending in 2028. Since 1993 the Czech Republic holds the former Czechoslovak legal position. Before Germany was reunited, waterway transport in Western Germany was hindered by the fact that inland navigation to Hamburg had to pass through the German Democratic Republic. The Elbe-Seitenkanal (Elbe Lateral Canal) was built between the West German section of the Mittellandkanal and the Lower Elbe to restore this connection. When the two nations were reunited, works were begun to improve and restore the original links: the Magdeburg Water Bridge now allows large barges to cross the Elbe without having to enter the river. The often low water levels of the Elbe no longer hinder navigation to Berlin. Many of these ferries are traditional reaction ferries, a type of cable ferry that uses the current flow of the river to provide propulsion. First attested in Latin as Albis, the name Elbe means "river" or "river-bed" and is nothing more than the High German version of a word (albiz) found elsewhere in Germanic; cf. Old Norse river name Elfr, Swedish älv "river", Norwegian elv "river", Old English river name elf, and Middle Low German elve "river-bed". 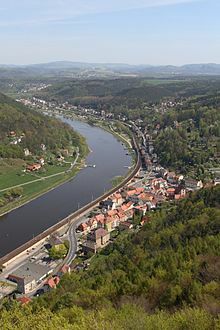 The Elbe was recorded by Ptolemy as Albis (Germanic for "river") in Germania Magna with its source in the Asciburgis mountains (Krkonoše, Riesengebirge or Giant Mountains), where the Germanic Vandalii lived. The Elbe has long been an important delineator of European geography. The Romans knew the river as the Albis; however, they only attempted once to move the Eastern border of their empire forward from the Rhine to the Elbe, and this attempt failed in the Battle of the Teutoburg Forest in 9 AD, after which they never seriously tried again. In the Middle Ages it formed the eastern limit of the Empire of Charlemagne. The river's navigable sections were also essential to the success of the Hanseatic League and much trade was carried on its waters. Since the early 6th century the areas east of the rivers Elbe and Saale (which had been depopulated since the 4th century) were populated by Slavic tribes called the Polabian Slavs. From the 10th century onward, these lands were conquered by the Ottonian Dynasty and slowly Germanized, including during the Wendish Crusade of 1147. The Elbe delineated the western parts of Germany from the eastern so-called East Elbia, where soccage and serfdom were more strict and prevailed longer, than westwards of the river, and where feudal lords held bigger estates than in the west. Thus incumbents of huge land-holdings became characterised as East Elbian Junkers. The Northern German area north of the Lower Elbe used to be called North Albingia in the Middle Ages. When the four Lutheran church bodies there united in 1977 they chose the name North Elbian Evangelical Lutheran Church. Other, administrative units were named after the river Elbe, such as the Westphalian Elbe département (1807–1813) and the Lower Elbe département (1810), and the French département Bouches-de-l'Elbe (1811–1814). In 1945, as World War II was drawing to a close, Nazi Germany was caught between the armies of the western Allies advancing from the west and the Soviet Union advancing from the east. On 25 April 1945, these two forces linked up near Torgau, on the Elbe. The event was marked as Elbe Day. After the war, the Elbe formed part of the border between East Germany and West Germany. During the 1970s, the Soviet Union stated that Adolf Hitler's ashes had been scattered in the Elbe following disinterment from their original burial site. ^ Bailey, Nathan (1730). "Mother-Tongue". Dictionarium Britannicum: Or a More Compleat Universal Etymological English Dictionary Than Any Extant ... T. Cox. ^ Ludovici, Christian (1765). Christian Ludwig Teutsch-Englisches Lexicon: Worinne nicht allein die Wörter, samt den Nenn- Bey- und Sprich-Wörtern, sondern auch sowol die eigentliche als verblümte Redens-Arten verzeichnet sind. Aus den besten Scribenten und vorhandenen Dictionariis mit grossem Fleiß zusammen getragen (in German). Johann Friedrich Gleditschens Buchhandlung. p. 507. ^ Heylyn, Peter (1673). Cosmography in Four Books. Containing the chorography and history of the whole world ... Revised and corrected by the author, etc. London: Anne Seile&Philip Chetwind. p. 398. ^ a b c "Elbe River basin" (PDF). International Commission for the Protection of the Elbe River. Retrieved 2018-03-20. ^ The commission was staffed with two representatives of Czechoslovakia and one representative of Anhalt, Belgium, France, Hamburg, Italy, Prussia, Saxony, and the United Kingdom each, with Czecholosvakia and the German states being those, whose territory was crossed by the Elbe and thus competent for maintaining navigation installations. Cf. Der Große Brockhaus: Handbuch des Wissens in zwanzig Bänden: 21 vols., completely revised ed., Leipzig: F. A. Brockhaus, 151928–1935, vol. 5 (1930): Fünfter Band Doc–Ez, article: 'Elbe', pp. 400seqq., here p. 402. No ISBN. ^ Text in League of Nations Treaty Series, vol. 26, 220–247. ^ "Google Maps". Google. Retrieved 2008-02-03. ^ "Public transport operators co-operating in the HVV partnership". Archived from the original on 2009-03-31. Retrieved 2009-03-26. ^ Maxim Tkachenko (11 December 2009). "Official: KGB chief ordered Hitler's remains destroyed". CNN. Retrieved 11 December 2009. Rada, Uwe (2013). Die Elbe. Europas Geschichte im Fluss (in German). Munich: Siedler. ISBN 978-3-88680-995-0. Wikimedia Commons has media related to Elbe.